In the past few years, I’ve done a tremendous amount of genealogy. I find it fascinating and have learned things I would never have known. Why is it important to me? I don’t have a good answer but I am passionate about preserving the past. History directs my movements, inspires me to write for our local historical association, and encourages me to document the history of our local school district. There is so much that people don’t know about the past. Back in 2010 when I was cleaning out my dad’s apartment after his death, I found some items I had never seen along with some I had seen for as long as I can remember. One item was an old lamp, badly stained by decades of cigarette smoke. There was never a question of me casting it aside. The lamp was fashioned from an old jug. Since then I’ve learned that vessels of this type are known as stoneware advertising jugs. Once upon a time they contained various liquids, depending upon the business they advertised. What I didn’t know was they are very collectible and there is a huge market for them. My stoneware lamp says, “M. Dugan, Cor. Arch & So Pearl Sts., Albany, NY.” What I know is that Michael Dugan was my great-great grandfather—my paternal grandmother’s grandfather. I’d heard through the years he ran a bar or saloon and was a liquor peddler. According to Federal Census records, he and his family lived on Arch St. This is considered part of the South End in Albany. The South End has always had a reputation for being a “tough area.” I’ve searched through many records but do not know on which corner this establishment stood. Two of the corners still exist, the others have been incorporated into a full portion of roadway and parking lot. Of the little I know about Michael, he was born in Ireland in 1835 and came to the US before the Civil War. Why he came to Albany, I have no idea. He served during the Civil War as part of the NY 13th artillery, and had 6 children. Cemetery records tell me two of his sons died young (14 and 19). A third son I cannot trace. Of his three daughters, one (Minnie [nee Mary]) was my great grandmother. I am unable to determine the fate of the other two. Michael died in 1906 having outlived one wife and leaving another to mourn his loss. So there is no doubt that the stoneware advertising jugs I have are antiques. The larger of the two came to me the other day. In the past few years, I’ve searched for these on the Internet and would stumble upon auctions that had already occurred. To find this one recently was a dream come true. 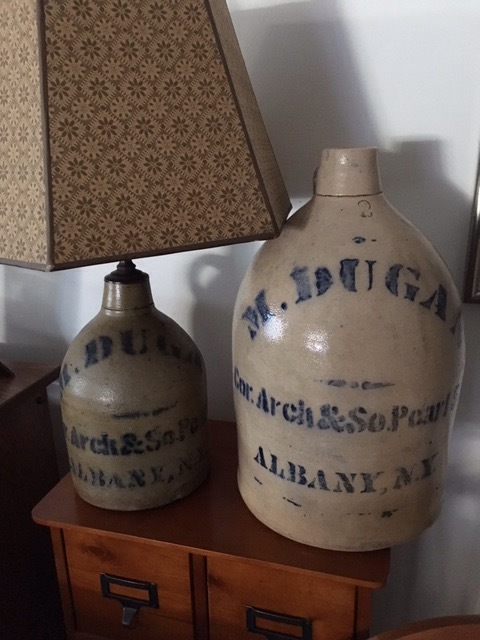 Plus, it’s a 2 gallon jug which I never knew existed (with the Dugan name on it). I will continue to search because I want to bring home some more. Why? I don’t really know but I want them back in the family. This entry was posted in family, genealogy, history, pottery and tagged family, genealogy, history, nostalgia, pottery, stoneware. Bookmark the permalink.